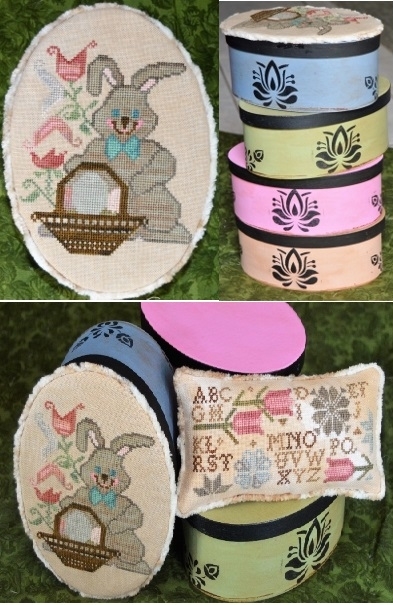 COMING SOON .. From Abby Rose Designs, this kit includes a hand painted, stenciled, stained, waxed paper mâché box, two design charts, and 1 yard of chenille trim for the box and 9 x 6 piece of velveteen for the pillow backing. 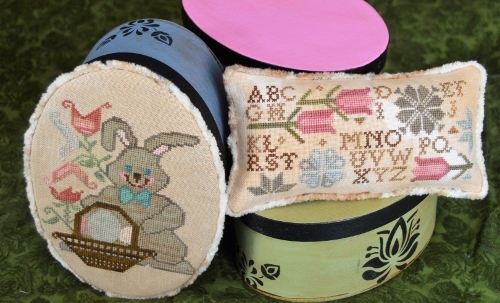 The oval box measures 7" in length by 5" wide and 3" high with the box top painted so you will be able to display it even if the bunny hasn’t been stitched - choose from Colonial Blue, Basil Green, Petal Pink or Peach. Not included is the fabric - 32ct Creme Brulee linen or the fibers - Gentle Art Sampler Threads ( Endive, Pecan Pie, Faded Rose, Antique Rose, Wood Trail, Otter Creek, Cameo Pink, Shaker White, Lexington Green, Victorian Pink, and 2 of Toasted Barley) and Weeks Dye Works (Tin Roof).